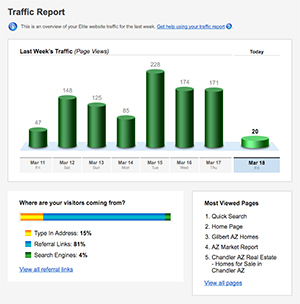 As a result I am seeing a 170% increase in the number of website page views. Q: What are your personal goals with regards to your iHOUSEweb Website? A: The website is a vehicle to engage your community to let them know who you are and what you can do for them. Your website should do all of this and more. 1) Be a reliable community resource that is constantly updated with new listings and thought-provoking and engaging content. 2) Be a real estate resource where neighbors and friends can get an update on local home values or info about a neighborhood or local area event. 3) Be a business card 24 hours a day, 7 days a week that can be found anytime. 4) Have a regular flow of fresh blog posts that match your interior website pages that draws the visitor in to explore your website. 5) Obviously, the overall goal is to generate leads and improve my business! Q: Where did you start, what did you keep in mind when designing your website? A: I did a lot of role playing! Specifically, pretending to be different types of website visitors: • I imagined I was brand new to the area and what would I want to know to help me decide where to live. • I often have clients asking me questions about the buyer/seller process. I figured if they were asking the questions, then I should provide the answers on my website that they can easily be search for. • I put myself in the position of a corporate transferee trying to understand the differences between the cities within my service area. Or what if I was retiring and moving from another state, I want to be able to provide those folks one page with all the information they would ever need. • I wanted to demonstrate deep local knowledge to website visitors by writing about and tracking market conditions. • The iHOUSEweb product allows unlimited page creation matched with the ability for unique tagging for individual pages. Then I'm able to use things such as visitor registration, dream home finder, and Saved Searches to encourage them to stay. Q: What features / tools are most valuable to you? How do you use them? A: A great IDX is vital! I prefer to set up searches on behalf of clients, but many are not willing to pick up the phone and run straight to the website. My site allows free unlimited access to the MLS data feed, AND gives them the ability to register for free listings updates without having to speak with me. This keeps clients coming back to my website rather than other search portals. I refresh all market stats for every community I serve monthly, plus I embed market data graphs provided by my MLS so users can quickly see historic information about how the real estate market has and is currently performing. I really like the templates that iHOUSEweb provides. They are completely mobile optimized and you can show clients how easily they can access your website at any time. 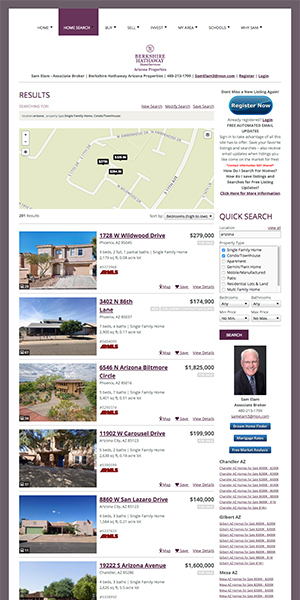 I have updated content in my community pages by having numerous community specific links to predefined MLS home searches by unique property features, zip codes, subdivisions, by school district and price ranges. Q: How has iHOUSEweb assisted you in accomplishing your goals? 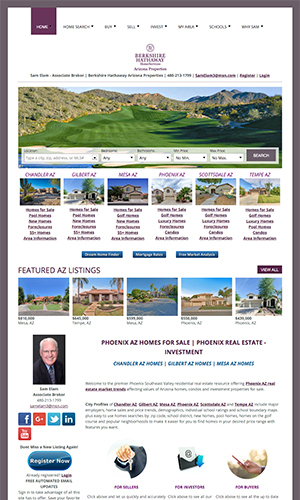 A: iHOUSEweb has helped me build a highly user-friendly, easy-to-view and digestible website. I had had my iHOUSE Website for 5 years and thought it was time to discuss some ideas to improve my experience. I couldn't believe they would be willing to make those suggested changes for me; it seemed too good to be true. I am ecstatic with the changes that were made and equally impressed with how quickly they were accomplished. As a result, since iHOUSEweb tuned up my website, I have seen a 170% increase in the number of page views. I can track the most viewed pages within my website and can clearly see an increase in website engagements whenever I post a blog or update my websites content. Q: What results have you and your website achieved? • In February 2015 I had 1350 page views. In February 2016 that increased to 3648 Page Views. • In March 2015 my website recorded 1317 page views. In March 2016 that tripled to 3960 page views. • On average, my iHOUSEweb website generates 4 quality leads per month!